For the 2008 film, see Jack Rio (film). Jack Louis Del Rio Jr. (born April 4, 1963) is an American football coach who is currently the head coach of the Oakland Raiders of the National Football League (NFL). He was a professional football player who played linebacker for four teams over eleven years in the NFL. Del Rio attended the University of Southern California, where he played football and baseball for the Trojans. He became a coach after his retirement and was hired to his current position as head coach of the Raiders in January 2015. He had previously been the head coach of the Jacksonville Jaguars from 2003 until 2011 and was the second coach in the team's history. Del Rio is a one time Super Bowl champion, having been the linebackers coach on the Super Bowl XXXV-winning Baltimore Ravens. He has also served as an assistant with the New Orleans Saints, the Carolina Panthers, and the Denver Broncos, serving as the defensive coordinator for the latter two squads. Del Rio was born in Castro Valley, California to a father of Spanish and Italian descent. He attended Hayward High School, where he developed into a notable three-sport athlete. In football, he helped his team win a North Coast Section 2A Championship. In baseball although he was the starting catcher, in one game he was used as a pitcher and struck out 16 in a playoff game against Mission San Jose-Fremont. He and former Seattle Mariners manager Don Wakamatsu were teammates in baseball and football. He was selected by the Toronto Blue Jays in the 22nd round (550th overall) of the Toronto Blue Jays, out of high school, but opted instead to attend college and accept a scholarship from the University of Southern California to play both football and baseball. In football he became a four-year starter. As a senior he earned consensus All-American honors, was a runner-up for the Lombardi Award, given to the nation's best lineman or linebacker and was named along with quarterback Tim Green, co-MVP of the 1985 Rose Bowl. He finished his college career with 340 tackles, including 58 tackles for loss. In baseball he batted .340 while being a two-year starter at catcher, on a team that also included future Major League Baseball players Mark McGwire and Randy Johnson. In 2015, he was inducted into the USC Athletic Hall of Fame. Del Rio was selected by the New Orleans Saints in the third round (68th overall) of the 1985 NFL Draft. He was also selected in the 1985 USFL Territorial Draft by the Los Angeles Express. As a rookie he started 9 games at right inside linebacker, tied a franchise record with 5 fumble recoveries and earned NFL All-rookie honors. In 1986, he lost his starting position to Alvin Toles after the season opener. On August 17, 1987, he was traded to the Kansas City Chiefs in exchange for a fifth round draft choice (#112-Greg Scales). In 1987, he was acquired by the Kansas City Chiefs to play outside linebacker, reuniting him with former Saints defensive coordinator John Paul Young. He started 7 games at right outside linebacker in his first season with the team and 10 games at left outside linebacker in 1988, while registering 77 tackles. He was released on August 29, 1989. August 31, 1989, he was claimed off waivers by the Dallas Cowboys, posting 38 tackles, 2 fumble recoveries and one pass defensed. The next year he finished with 104 tackles (third on the team) and 1.5 sacks. In 1991, he replaced Eugene Lockhart as the starter at middle linebacker, while leading the team with 130 total tackles, 53 assists and 77 solo tackles. In the 90's, the Cowboys organization felt they could find linebackers through the draft, without the need of paying a premium and adversely impacting the salary cap, so they allowed talented and productive players like him, Ken Norton, Jr., Darrin Smith, Dixon Edwards, Robert Jones and Randall Godfrey, to leave via free agency, instead of signing them to long-term contracts. On March 4 1992, he was signed as a Plan B free agent by the Minnesota Vikings, recorded 149 tackles and was named NFC Defensive Player of the Week. He led the team in tackles for three consecutive years and was selected to the 1994 Pro Bowl as a 'need player'. The next year he suffered a knee injury in the week 9 game against the Chicago Bears and started one late season contest after that, while being replaced with Jeff Brady. On June 2, 1996, he signed a one-year contract with the Miami Dolphins, reuniting him with former Cowboys head coach Jimmy Johnson. On August 4, he was released after being passed on the depth chart by rookie Zach Thomas. He finished his career with 160 games appearances (128 starts), 1,078 tackles, 12 sacks and 13 interceptions. Del Rio began his coaching career with the New Orleans Saints in 1997, hired by head coach Mike Ditka as the strength and conditioning coach. 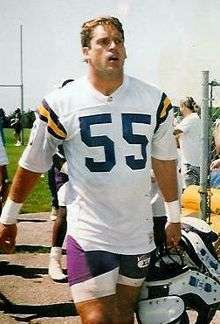 In 1999, he accepted a position with the Baltimore Ravens as the linebackers' coach. He is in part credited for the success of the Ravens' defense, particularly in the 2000 season. After the 2001 season, he was named defensive coordinator of the Carolina Panthers and in his first season, in 2002, he led them to the second best defense in the league. In 2003, Del Rio became the second head coach of the Jacksonville Jaguars following Tom Coughlin's dismissal. In his first season, he led the team to a 5–11 record. That year, Jacksonville finished the season with the second-ranked rush defense and sixth best overall defense, having ranked 25th and 20th in those two categories, respectively, the year prior. In 2004, the Jaguars narrowly missed the playoffs with a 9–7 record, the first winning record in five seasons. The following season, the team made the playoffs for the first time since advancing all the way to the AFC title game in 1999. They qualified as a wild card; however, the season was ended with a 28–3 loss to the New England Patriots. After missing the playoffs in 2006, Jacksonville cut quarterback Byron Leftwich in favor of David Garrard. The team returned to the playoffs in 2007 winning their first playoff game since 1999. On April 3, 2008, Del Rio's contract with the Jaguars was extended through the 2012 season. On January 11, 2010, Del Rio was offered the head coaching job at USC, his alma mater. The next day he denied receiving an offer from USC, stating that the offer was "manufactured". Later that afternoon, he rebuffed USC officially, announcing that he would remain with the Jaguars at least through the duration of his current contract. On November 29, 2011, Del Rio was fired as Jacksonville's head coach. He left with a regular season record of 68–71 and a 1–2 record in two playoff appearances over his nine years. The mantra "Keep chopping wood", introduced by Del Rio during the 2003 season, was intended to indicate how the team would slowly whittle away the huge obstacles in front of them. Del Rio placed a wooden stump and axe in the Jaguars' locker room as a symbol of his rallying cry. After his teammates had been taking swings at the wood with the axe, Punter Chris Hanson followed suit and seriously wounded his non-kicking foot. Hanson missed the remainder of the 2003 season, being replaced by Mark Royals. Del Rio became the second NFL head coach since 1993 to wear a suit on the sidelines during a November 20, 2006 regular season contest against the New York Giants, immediately following then San Francisco 49ers head coach Mike Nolan who had sported the look the previous day in a win over the Seattle Seahawks. Del Rio's Jaguars won that game by a score of 26–10. Previously, a sponsorship deal between the NFL and Reebok prohibited coaches from wearing anything but Reebok clothing, but a series of events—including Nolan petitioning for permission to wear a suit and Reebok planning to unveil a formal line of clothing in 2007—led to the NFL adopting a rule that permits coaches to wear a suit twice a year. On January 27, 2012, Del Rio was hired as the new defensive coordinator of the Denver Broncos. In week two, Del Rio was fined $25,000 for berating the replacement officials. On November 4, 2013, Del Rio was handed the head coaching duties and named interim head coach for several games when head coach John Fox was sidelined due to medical reasons. On January 14, 2015, Del Rio was hired to become the new head coach of the Oakland Raiders, replacing the fired Dennis Allen (who coincidentally had preceded him as the Broncos defensive coordinator) and interim head coach Tony Sparano. Super Bowl champion (XXXV) as coach. Del Rio earned an undergraduate degree in political science from the University of Kansas in 1990, while he was a player for the Kansas City Chiefs. His son, Luke Del Rio, is a college football quarterback for the Florida Gators. Underscoring the UCLA–USC rivalry, on December 12, 2006 Del Rio appeared at a press conference wearing a UCLA basketball jersey after losing a bet with ex-UCLA running back Maurice Jones-Drew. UCLA's football team had recorded one of the biggest upsets in school history by defeating USC the previous week. However, after acknowledging his loss in the bet, he removed the UCLA jersey, revealing a USC polo shirt underneath. Del Rio's college roommate at USC was former ESPN football analyst and NFL/CFL quarterback Sean Salisbury. ↑ "Jack Del Rio's firing the first of more coaching dismissals to come - Don Banks - SI.com". Sportsillustrated.cnn.com. Retrieved 2012-09-26. ↑ Clemons, Shane (2011-02-21). "How Do We Evaluate Jack Del Rio?". Big Cat Country. Retrieved 2012-09-26. ↑ "Jaguars Fire Jack Del Rio, Team Sold". SportsFilter. 2011-11-29. Retrieved 2012-09-26. ↑ Paige, Woody (August 24, 2014). "Paige: D-coordinator Jack Del Rio "made right choice" with Broncos". Denver Post. Retrieved January 18, 2015. ↑ "Raiders head coach Jack Del Rio still hero in Hayward". Retrieved February 19, 2016. ↑ "Perseverance helps get Don Wakamatsu his first job as M's manager with Alvin Davis' approval". The Seattle Times. 2008-11-19. ↑ "Pete Carroll, Jack Del Rio selected to USC Athletic Hall of Fame". Retrieved February 19, 2016. ↑ "It's a Long Wait for USC's Del Rio; He Isn't Picked Until Third Round". Retrieved February 19, 2016. ↑ "Del Rio Deal Boosts Chiefs Defense". Retrieved February 19, 2016. ↑ "Chiefs pick up 'Little Train'". Retrieved February 19, 2016. ↑ "Del Rio's Departure Leaves Dallas "D" Thin in Middle". Retrieved February 19, 2016. ↑ "Cowboys sign Coakley for 6 years, $25 million". Retrieved February 19, 2016. ↑ "Cowboys' Williams Honored". Retrieved February 19, 2016. ↑ "Del Rio named to Pro Bowl squad". Retrieved February 19, 2016. ↑ "Dolphins sign Del Rio, re-sign Kosar". Retrieved February 19, 2016. ↑ "Cut By Dolphins, Del Rio Retiring". Retrieved February 19, 2016. 1 2 Mike Florio (November 29, 2011). "Del Rio out in Jacksonville". profootballtalk.nbcsports.com. NBC Sports. Retrieved November 29, 2011. ↑ "Del Rio is a done deal". Jaguars.com. 2008-04-03. Retrieved 2008-04-04. ↑ "Jack Del Rio denies receiving offer to coach USC Trojans". ESPN Los Angeles. 2010-01-12. Retrieved 2010-12-28. ↑ Kamm, Grayson. "Coach Del Rio's Suit Turns Heads". WLTV-TV/WJXX-TV. Retrieved 9 September 2015. ↑ Jones, Lindsay (January 27, 2012). "Broncos hire Jack Del Rio as defensive coordinator". denverpost.com. Retrieved January 27, 2012. ↑ Sessler, Marc (November 4, 2013). "Jack Del Rio tabbed Denver Broncos' interim coach". nfl.com. Retrieved January 15, 2015. ↑ Bair, Scott (January 14, 2015). "Raiders get their man, hire Jack Del Rio as new head coach". Comcast SportsNet Bay Area. ↑ "Jack Del Rio Record, Statistics, and Category Ranks". Pro-Football-Reference.com. Retrieved 2010-12-28. ↑ "Pete Carroll, Jack Del Rio selected to USC Athletic Hall of Fame". Retrieved 15 January 2015. ↑ "2010 NCAA Silver Anniversary Award". Retrieved 14 December 2009. ↑ "Rose Bowl Most Valuable Player Award (MVP)". Retrieved 15 January 2015. ↑ Garfield, David. "NFL success, KU degree among Del Rio's rewards," KU Alumni magazine, Issue 5, 2007, page 55. ↑ "Jags beat Colts but Del Rio loses bet". NBCSports.com. 2007-02-03. Retrieved 2010-12-28.